Who would have thought that a Portuguese band I had been following with interest for some time now would end up working in a studio not 10 minutes away from where I live? It was a matter of time before we crossed paths, and what began as an interview via email became an invitation to drop by the studio for a chat. It was around noon that I arrived at the Norton de Matos Music Academy in Coimbra, central Portugal, where the band has set their headquarters. Two members of the band are teaching there, so it is a highly convenient venue. I am greeted at the door by João Francisco, guitar and vocals, avid Pink Floyd fan. As we cross the studio proper into the control room, João Francisco introduces a new member of the band to me – I was getting ready to shake someone’s hand when he proudly pointed to an olive-green metal box. “Do you recognize that?” he asks. Can’t say I did. “There’s one just like that on Pompeii”, he explained. Turns out it’s a Binson Echorec, a 70’s echo machine as seen being used by David Gilmour on Pink Floyd’s cult film - even before the interview begins, the floydian influence heard on the band’s first album is already seen in the gear. This is a special day for the band. 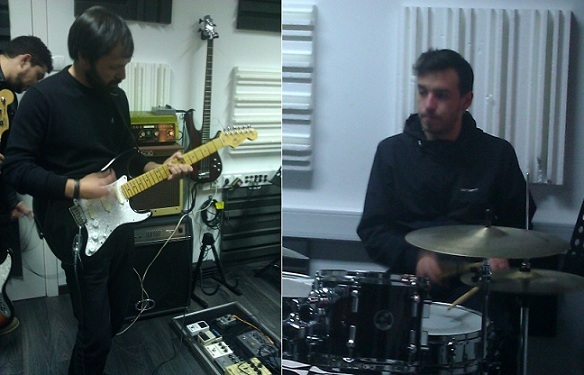 They are working on a follow-up to their first album, 2012’s Queda Ascendente, have a new toy to play with (the Binson), and have a photo shoot scheduled – this means the whole band is present, something that doesn’t happen every day. As everyone finds a seat, it’s time to whip out some questions. First off, what’s in a name? How would you describe your music? What are your influences? What kind of instruments do you use? What kind of sound do you try to attain? Isn’t it risky to sing in Portuguese? Don’t you fear being confined to a smaller fringe market? Care to guide us trough each one of them? “The opener and closer represent the key concept, that of “almost”. “Quase nós” tells of everything that one might have wished to achieve but never really got to. It centres on bad luck and cowardice as a wake-up call, featuring a nervous and weeping guitar: “(…) someone half-dead is still alive, but someone half-alive has already died!”. “Balada ao Ensandecer” is about madness, ending up in suicide. “Rosa dos Ventos” is about getting to know your inner self, a cardinal, directional e timeless quest. “Apicultor de Homens” adresses the idea of the Wizard of Oz, in the way the poem’s “me” sounds bigger and stronger that he really is. He’s actually an aggressive, manipulative being without scruples that ends up being defeated by the oppressed. “Saber Porque Não” is a straight-to-the-point song dealing with the worker’s apathy in the face of exploitation. Queda Ascendente has a very distinct Floydian sound, reminiscent of Dark Side of the Moon or their later works. Don’t you fear being dismissed as clones? What do you think of the way the album’s been received? “Stimulated and simultaneously disappointed. The band created the album for the satisfaction of its own musical ego, knowing that this type of music isn’t very well known and accepted in Portugal. The weird thing was that the album was well received by less demanding listeners, but completely ignored by fans of the genre. On the other hand, despite being sung in Portuguese, it was surprising for us to see it so well received internationally. Can you tell me a bit about the album’s production, from the idea to the physical disc? Speaking of which, you had to get a foreigner to do the mixing. Why was that? So the band is working on a second album. We again discuss the Floyd influence on the first record. João Francisco confesses to having shed some of that influence. “Basically, we sent Floyd out the window”, summarizes drummer Renato. With a background in funk and punk rock, he’s quite far from João Francisco in his appreciation for the English space-rockers. “Hardly ever heard them before working with Torga Ostera – not my thing. They have grown on me, though”, he confessed. They offer to play me a two of the songs they are working on. These are unpolished, working versions, recorded at rehearsals. I gladly accept. “They might come as a shock if you enjoyed the first album”, they warn me. I’m not shocked, but rather pleasantly surprised. Despite being only hints at what the final songs may sound like, already there is a change in sound. 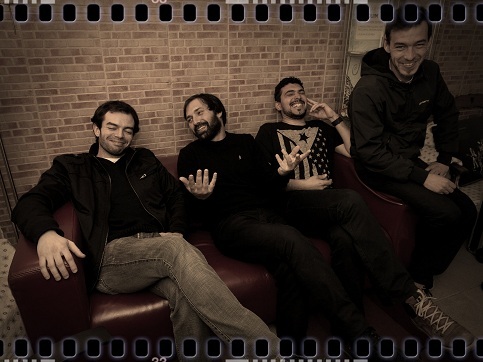 The first one, “Malmequer”, displays a kind of aggressiveness not really found on Queda Ascendente, while the other one, “Maçã”, is a clear indicator of the song-driven formula the band are working on for the next album. So what awaits Torga Ostera further down the road? Any contact with labels or distributors in sight? What difficulties have you bumped into as a progressive rock band in the 21st century, in a country with little tradition and representation in the genre? What do you think of modern progressive music, in general, and the Portuguese scene, in particular? The interview is curtailed by the arrival of the photographer. The group strikes a pose for a couple of shots. Against their better judgement they ask this improvised reporter to take a picture with them. It is now 2:30pm and no one has had lunch yet, so we head across the street for some sandwiches. Conversation at the table drifts from promoting the band, the inner workings of ProgArchives, current politics and, inevitably, gear - the boys sure know their material. After the quick lunch, Jorge Marinheiro kindly invites me to return with them to the studio as they work on the guide tracks for the new album. In the control room, Eurico and Jorge toss around different ideas for the bass on one of the songs, the loud clicking of a metronome making sure no one skips a beat. For someone like me, at the far end of the music business, it’s a privilege to watch a band at this stage of the recording of an album first hand. In the time I’m there they do three or four takes before settling on a couple of minutes they’re satisfied with, for the meantime. Only a wall separates these two from the other half of the group, who are in the studio testing out their new toy, the Binson Echorec. João Francisco and the olive-green gizmo at his left, with Renato Dias providing a beat. They work around riffs and power chords, the metallic echo of the machinery taking me back to that time I never lived when experimentation was the rule. João Francisco sounds quite pleased with the device, which he actually got cheap from an auction website. Smiles all round after this small distraction. The band surely is in high spirits and you can feel the chemistry among them. “Are your ears okay?” jokingly asks Renato, before he eventually leaves for a doctor’s appointment with his pregnant other half. Eurico will soon follow, having a bus to catch that will take him back to Lisbon where he lives and works. Reminders that there is much more than just music to these boys’ lives. 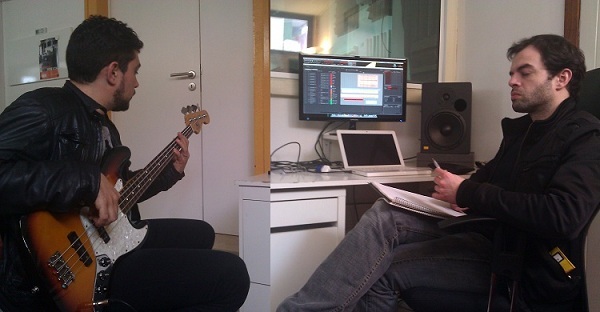 João Francisco seems to approve Eurico’s work on the bass, while Jorge Marinheiro takes out an Alesis Ion synth to work on soundscapes for a track. Jorge is keen to get some work done before nightfall, when the studio reverts back into an after-hours teaching room of the Norton de Matos Music Academy – a small price to pay for excellent conditions. One more question to ask. Finally, anything you wish to say to the ProgArchives.com community? We’d like to praise the overwhelming, intense and rigorous research work by the Admins and Collaborators at ProgArchives. It’s important to reinforce the work being developed regarding research and promotion of Portuguese progressive rock on an international level. It would be great if foreign interest could stimulate the creation of more music in this country, because internally we are rotting due to the lack of culture and support. On our behalf, we appreciate having been added to the database, and we intend to deliver more and better music! I don't have any Portuguese music; think I might start here. Thanks! Kudos to the band for giving me their time and providing me some insight. It's a good starting point, if language is not a problem. Familiar sound but the singing in Portuguese gives a peculiar nuance.